Gershwin's The Man I Love has been arranged for cello quartet by Valter Dešpalj, professor of cello at music academies in Zagreb and Liechtenstein. A graduate from the Juilliard School, Mr. Dešpalj studied cello under Leonard Rose and chamber music with Felix Galimir and the Juilliard Quartet. Mr. Dešpalj has performed all over the world, held guest professorship at conservatories throughout Europe, and been an editor of cello music with major music publishers. This cello quartet arrangement of the popular Gershwin song The Man I Love is based on the composer’s simple version for voice and piano. So, it also includes the introduction that is normally omitted, possibly for reason of making the song shorter and more “punchy”. This omission, however, is not very fortunate, because the introduction is really essential, bringing an atmosphere of romantic longing after which the refrain comes out even more poignant. Here the sound and clarity of four voice texture almost reminds of string quartet writing by the Viennese classics. In the refrain, of course, free rhythmical patterns can be improvised, as is the tradition. 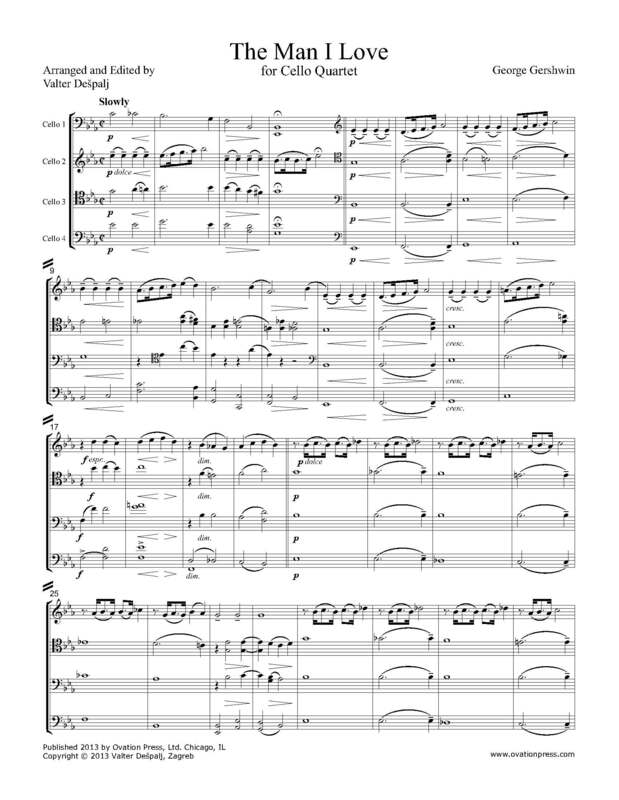 Download and print the score today to gain access to this expertly edited arrangement of Gershwin's The Man I Love for cello quartet by Valter Dešpalj!